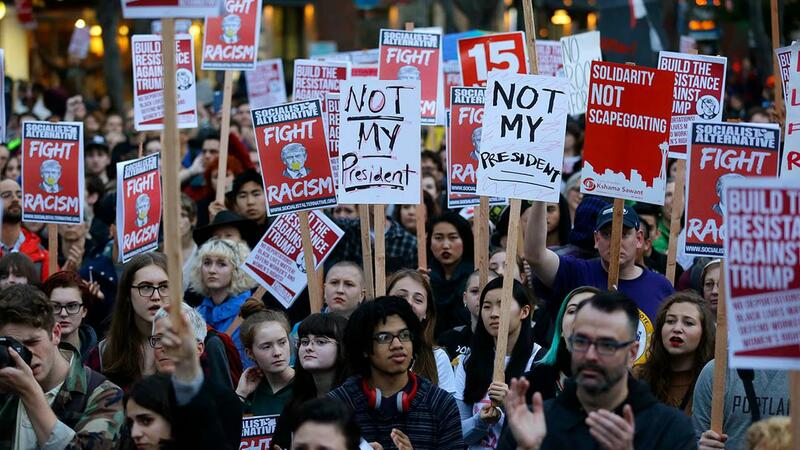 Protest against Donald Trump. Photo: Socialist Alternative. This past summer, hundreds of white supremacists and neo-Nazis mobilized in Charlottesville, Virginia to prove a point — that they were always here and were here to stay. With anti-Semites, fascists, and racists gathering at the “Unite the Right” rally on the University of Virginia’s campus and racial tensions flaring between white supremacists and counter-protesters, many reactions to the racist violence at Charlottesville were of disgust and sadness. Even in the wake of contentious partisan politics, both Republicans and Democrats condemned the actions of white supremacists and even called for President Donald Trump to take a stand against their egregious behavior. Trump’s lukewarm response to the events at Charlottesville and, subsequently, his defense of white supremacy, was so shocking to many that journalist Jonathan Cait in New York Magazine wrote, “what is new and even shocking is the intermingling of Republican politics with open white supremacy.” While many, like Cait, are claiming that Trump’s blatant racist and Nazi-sympathetic language is a new phenomenon in the Republican Party, quite the opposite is true. White supremacists, fascists, anti-Semites have always been integrated and included as political stakeholders in the Republican Party. Like Trump, Presidents Ronald Reagan and George Bush, Sr., were aware of the Nazis and white supremacists within the GOP and, rather than condemning them, knowingly welcomed them into the Republican Party in an effort to fight communism. Many of those Nazis welcomed into the GOP would join the Republican Heritage Groups Council, a group whose members were “displaced fascists” who immigrated from Eastern and Central Europe to the United States after World War II to “avoid the consequences of their collaboration with the German occupation of Eastern Europe and the Soviet Union.” From 1948 to 1952, thousands from Eastern and Central Europe immigrated under the Displaced Persons Committee. However, while the Committee first excluded former members of Nazi groups, it would later allow persons from the Baltic Legion or the Baltic Waffen SS, who also participated in the extermination of Jews in the Baltic region. 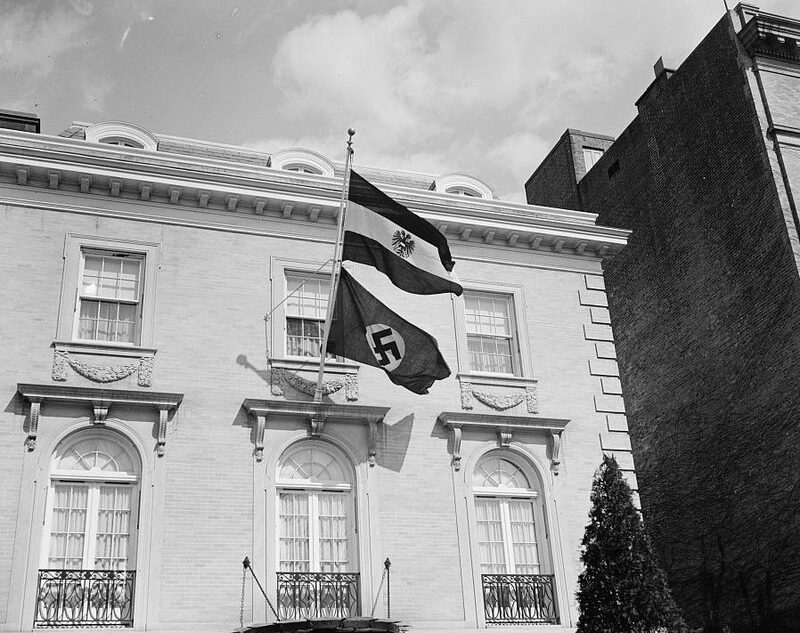 Nazi flag flies from Austrian legation in Washington, D.C. on March 12, 1938 (New York Public Library) . With about twenty-five ethnic groups comprising the Republican Groups Heritage Council, two groups were not represented: Black and Jewish. Here, with the obvious exclusion of these groups, it should be no surprise that one of the Council’s political objectives was to eliminate the Office of Special Investigations (OSI), the anti-Nazi and hate crimes unit of the Justice Department. While the Council did not focus on domestic issues of its ethnic constituents in the United States (i.e. unemployment, crime, and education), its main concern was to expand fascism, racism, and anti-Semitism in the Americas and Europe vis-à-vis American foreign policy. With the Council serving as a pivotal force in garnering presidential wins for Nixon, Ronald Reagan, and George Bush Sr., it would also be formidable in expanding the military-industrial complex under the auspices of the American Security Council (ASC), the Coalition for Peace Through Strength and the U.S. chapter of the World Anti-Communist League (WACL)–a fascist organization with a transnational following including Korean cult-leader Reverend Sun Myung Moon and neo-Nazis. Several members of these groups and other KKK and Nazi militias were pivotal in mobilizing and raising campaign funds to maintain their white supremacist ideals in electoral politics. Some of their other Republican clientele included representatives Helen Chenoweth-Hage, Steve Stockman and Linda Smith. The work of all of you has meant a very great deal to me personally, to the Party and to our cause…I can’t think of any others who have made a more visible contribution to the effort than those of you who are in this room today…. I want to encourage you to keep building the Party. Believe me, bringing more ethnic Americans into the fold is the key to the positive realignment that we are beginning to see take shape. Not only did Reagan and his advisors invite Ivan Docheff–founder of the Nazi youth group Bulgarian Legion–to the White House, he would also write and sign a White House fundraising letter for known white supremacist Roger Pearson in 1982. 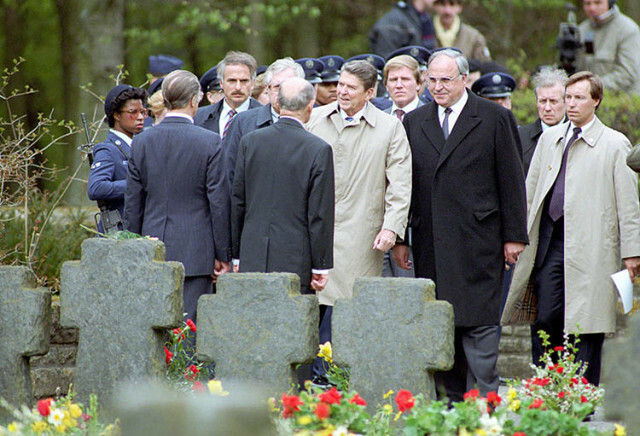 Reagan also caused controversy when visiting the Bitburg war cemetery in 1985, where he laid a wreath where 49 members of Hitler’s Waffen SS were buried. Claiming he was unaware of the SS troops, Reagan ultimately defended his decision, asserting the Nazi soldiers were also victims of Hitler’s regime. In 1988, Bush would speak at the Captive Nations Banquet, where he was introduced by Bohdan Fedorak (who had a questionable past with Nazism), the National vice-chair of Ukrainians for Bush. Moreover, after the Bush campaign was notified of having racists and Nazis among their ranks, the campaign announced it would investigate the charges. The Bush campaign never upheld its promise to investigate the charges and like Reagan, defended the behavior and rhetoric of their racist allies. Here, the lack of repudiation of racism by Reagan, Bush and countless other Republicans is telling of how far some will go to garner political power ­­­– even working with those who conspire to terminate marginalized people in the process. Ultimately, these examples underscore how white supremacy, Nazism, and the GOP have been inextricably linked. Trump’s actions–including his refusal to denounce white supremacists in Charlottesville; his appointments of former White House Chief Strategist Steve Bannon and Attorney General Jeff Sessions; and his pardoning of Sheriff Joe Arpaio–represent a continuation of this historical legacy. His most recent callous remarks in the aftermath of Hurricane Maria in Puerto Rico and his tweets about National Football League players and owners kneeling and linking arms during the National Anthem, reveals how his idea of a great America excludes people of color. Here, Jonathan Cait’s assumption that white supremacy and Nazism are new to the Republican Party is false. To the contrary, they have and will always be a part of the GOP–as they are part of the American political fabric as a whole.